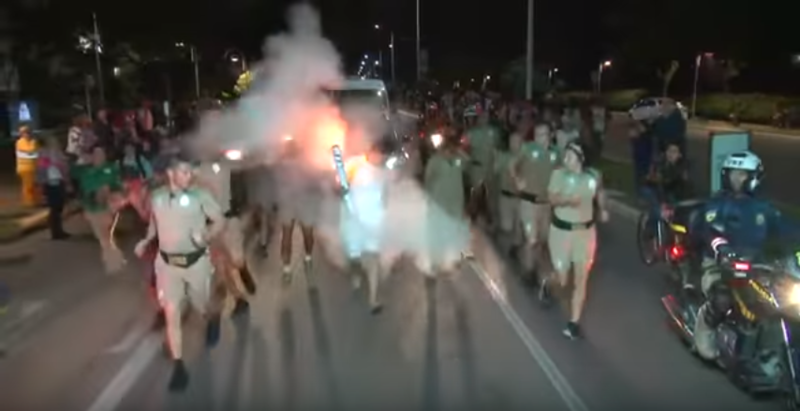 A protester attempted to put out the Rio 2016 Olympic flame with a fire extinguisher as it continued its journey through the Brazilian city of Joinville. Emerging from the assembled crowd, the man charged at a Torchbearer and managed to get away one spray of foam before being held back by police. It wasn’t enough to put the flame out, while the Torchbearer was unharmed. A number of Brazilian residents have protested as the Torch has passed through various regions of the country, claiming money should be directed elsewhere rather than being spent lavishly on the hosting of the Olympic and Paralympic Games. Last month, a relay leg in the Brazilian town of Maracaju was interrupted when a man attempted to throw a bucket of water on the Olympic flame. The man, named as Marcelino Mateus Silva Proença, was arrested after he fled the scene and was released on bail having been ordered to pay a fine of $295 (£224/€267). The incident involving Proença came after the People for the Ethical Treatment of Animals (PETA) criticised the killing of a jaguar which was used in the Rio 2016 Olympic Games Torch Ceremony in Manaus. The Torch visited the Amazon city on June 19 as the build-up to the Olympic Games continued in Brazil, with the ceremony being held at a zoo, located near to a military base. Following the ceremony, a female jaguar reportedly escaped from its handler and was shot four times with a tranquilliser dart. Despite being tranquillised, the jaguar was then shot dead by a solider, which has drawn criticism from numerous animal rights organisations. Rio 2016 organisers were also forced to cancel a section of the Olympic Torch Relay due to severe flooding in Brazil's northeastern region earlier last month. The Torch Relay is due to cover more than 20,000 kilometres in all across the whole of Brazil.